Marrakech and the area (essaouira and the high atlas). After breakfast, you will have full day tour to visit Marrakech. The visit will include:the Menara gardens, a magnificent pool surrounded by flowers, the Koutoubia Minaret, the Saadian Tombs, the museum of Dar Si Said with the best display of Berber arts and crafts, and the Bahia Palace…lunch will be in local restaurant, after that we walk through the colorful Souks of Marrakech. 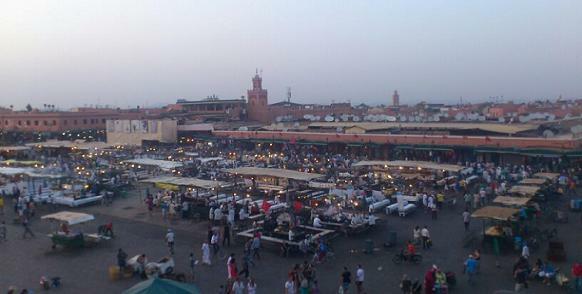 The day will concluded with a sunset drink overlooking the Jamaa El Fna square. Dinner and overnight will be in your hotel/Riad. This morning and after breakfast you will leave Marrakech into the mountains of High Atlas where you will visit some of the Berber villages. This day you will explore the striking countryside and the beautiful surrounding valleys and areas of the High Atlas Mountains. The tours/walks in the high atlas based at the spectacular Kasbah of Toubkal. Then you will enjoy lunch at Kasbah Toubkal’s terrace with its magnificent views of Toubkal. After lunch you will head down to the town center of Mlil which is a small and peaceful village in high Atlas Mountains and return to Marrakech. Dinner and overnight will be in your hotel/Riad. After lunch you will transferred to Marrakech, on the way back it is possible to stop at Argan oil co-operative to see how the Argan nuts from all the forests around Essaouira are converted into oils and soaps. Arrive to Marrakech. Dinner and overnight will be in your hotel/Riad. Enjoy a free day exploring the exotic city of Marrakech, with its beautiful Koutoubia mosque and fabulous central square – Djemma-el-fna. Packed full of colour, spicy aromas, traders, snake charmers and fortune tellers - Djemma-el-fna is a feast for all of the senses! Dinner and overnight will be in your hotel/Riad.